The international farmers and peasants network La Via Campesina and the research organisation GRAIN published a new booklet and poster and map explaining how big business and governments are moving to stop farmers from saving and exchanging their seeds, and shows how farmers are fighting back. 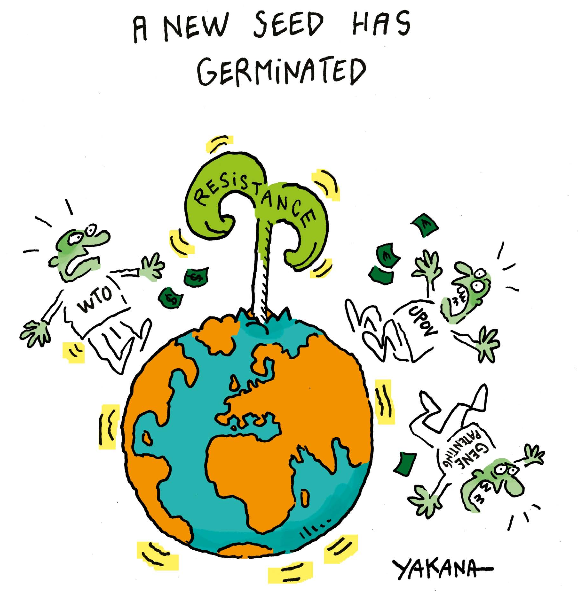 Control over seeds must remain in peasants’ hands. This is the principle, based in the production process, that guarantees the food sovereignty of rural communities and urban populations against multinationals and their enormous profits. Over centuries, peasant farmers have created the thousands of varieties of crops that are the basis of the world’s food supply and diversified diets. But for corporations who want to impose laws that will give them complete control of land, farming, food and the profits that could be made from this sector, these time-tested practices around seeds are an obstacle. For La Via Campesina, the law should instead guarantee the rights of peasants to conserve, use, exchange, use and sell their seeds and protect them from biopiracy. “Big business is carrying out, with the support of governments, a global legal offensive to gain complete control over seeds. This includes not only privatising seeds through new laws, but giving themselves new rights to physically search farmers’ homes and destroy their seeds”, says Camila Montecinos of GRAIN. Seed laws are evolving and becoming more aggressive in response to new demands from the seed and biotechnology industry. So-called free trade agreements, bilateral investment treaties and regional integration initiatives are hardening ‘soft’ forms of ownership rights over seeds. And laws strengthening intellectual property rights over seeds are being reinforced by other regulations that are supposed to ensure seed quality, market transparency, prevention of counterfeits, and the like. What is at stake is the very basis of peasant farmers’ existence. Social movements worldwide, especially peasant farmers organisations, have resisted and mobilised to prevent such laws being passed. Corporations and governments rely on secrecy and lack of transparency because they know that an informed citizenry will reject the privatisation of seeds. 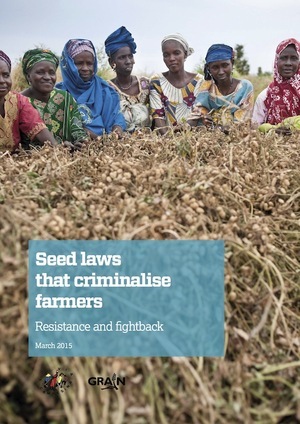 The booklet will strengthen the resistance by ensuring that as many people as possible – especially in the rural communities that are most affected – understand these industry-backed laws, their impacts and objectives, as well as the capacity of social movements to replace them with laws that protect peasants’ rights. a map and table tracking changes to seed laws around the world.